In the midst of a whirlwind of showy art, I am surprised that falling in love with a work of art still happens. 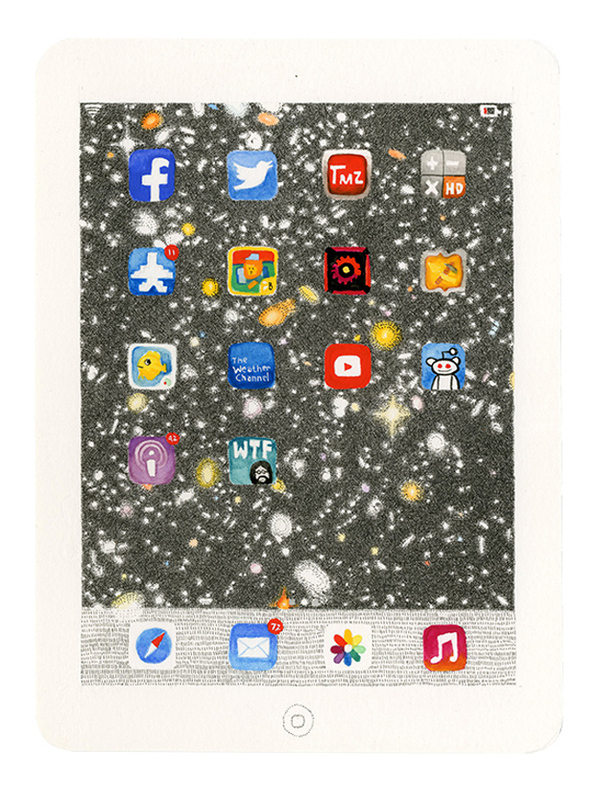 Such was my surprise when a drawing I had recently seen, Mia Rosenthal’s Google Portrait of Hubble Telescope, from her exhibition a little bit every day at Gallery Joe, stuck with me, appeared in my dreams at night, and popped into my mind as I woke up. Rosenthal’s work celebrates the mechanisms of the artistic process and the artist’s freedom to re-invent or create a personal language. Her drawings are practiced and refined; she takes her time in developing her ideas, conducting her research, and in producing clean and precise images. 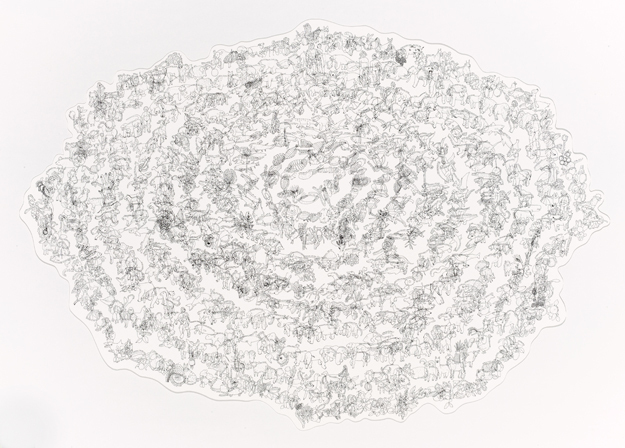 Rosenthal uses two different languages, each very much her own, to create her drawings. As in her previous body of work, she uses symbolic representations of organisms to create large compositions. In other drawings, she carefully places or layers her marks, building a complex composite image. In both her process and concept, Rosenthal assembles pieces (marks, images, symbolic representations, tedious research) into a single whole. In Life on Earth, Rosenthal creates a spiral, which documents and classifies 3.8 billion years of evolutionary history. 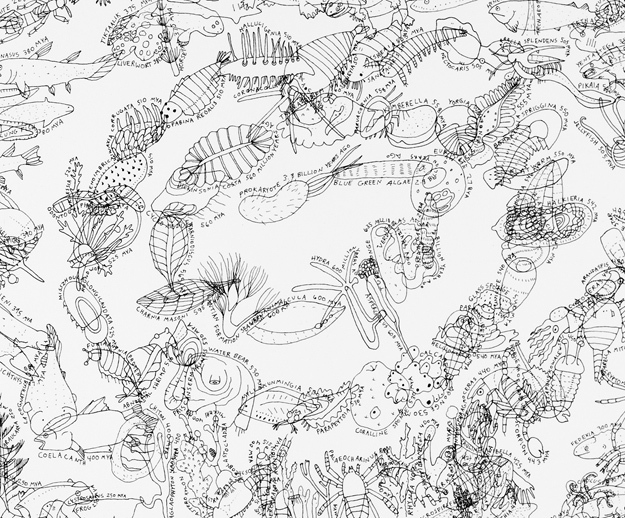 Even though the drawing betrays a child-like fascination with organisms, Rosenthal is not interested only in the science of taxonomy, but also in the unfolding of life. It is perhaps her way of understanding or coping with the world. Life on Earth goes beyond the realm of research and notation. It is personal and intimate; she includes the birth of her son in within the timeline. The work has a tactful sense of humor. The idea is simple and fresh, and the result, engaging and endearing. 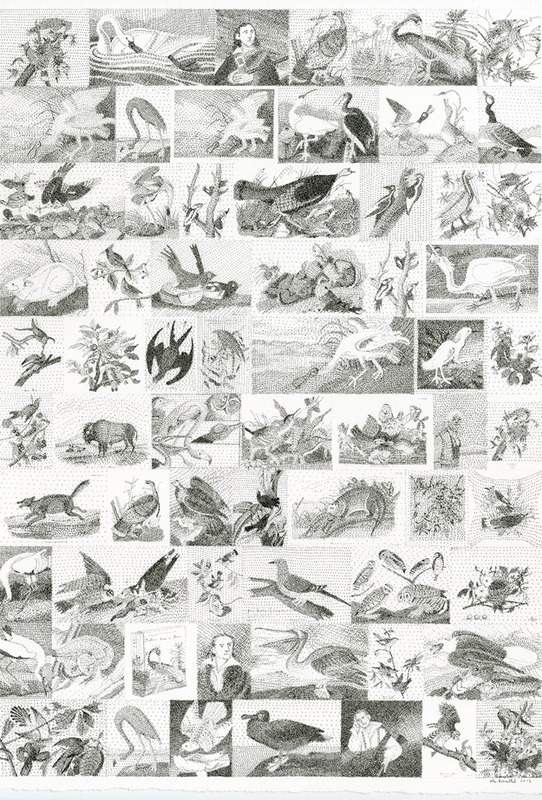 As in many of her drawings, especially her other Google portraits (Google Portrait of Audubon, … of Muybridge, etc. 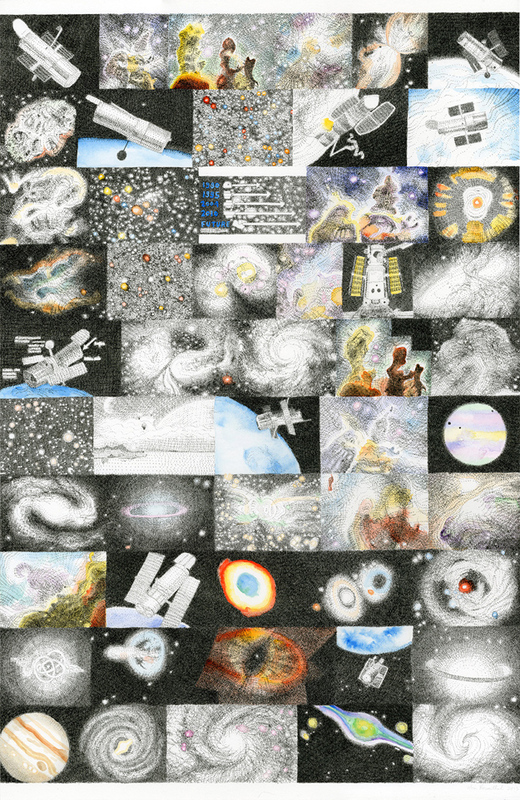 ), Google Portrait of Hubble Telescope, a visual survey of googled images of the Hubble Telescope, goes beyond the simple purpose of classification. It offers an expansive yet focused view of the telescope’s witnessing, of the universe through someone else’s lenses. Just like Rosenthal’s drawings, the telescope offers a removed view of the unfolding of the universe, of history, and of time and space. Internet search engines have built a language all their own, which Rosenthal taps into as she allows the Internet to lead the way. She carves out a portrait of the way we look at things, the way we acquire information, and the way in which a narrative develops according to how it is presented to us. Information does not necessarily reveal history or truth; it is often corrosive or reshuffled. It is a compilation, a glimpse, an interpretation. Humorously, but appropriately, Rosenthal includes in this exhibition not just images that are the result of documentation and research, but also the vehicles through which she conducts this documentation, her lenses: Laptops, iPads, and iPhones. Even though Rosenthal’s work is of-the-moment, it does not need to be categorized, associated with a current wave, concept or fad, in order to make sense. She is very much part of a generation whose information, data-gathering, and so-called truth about history and ourselves comes largely from the potentially unreliable sources of the Internet. But she uses the visual language of the Internet in an honest, sensible way, one that is endearing and captivating. 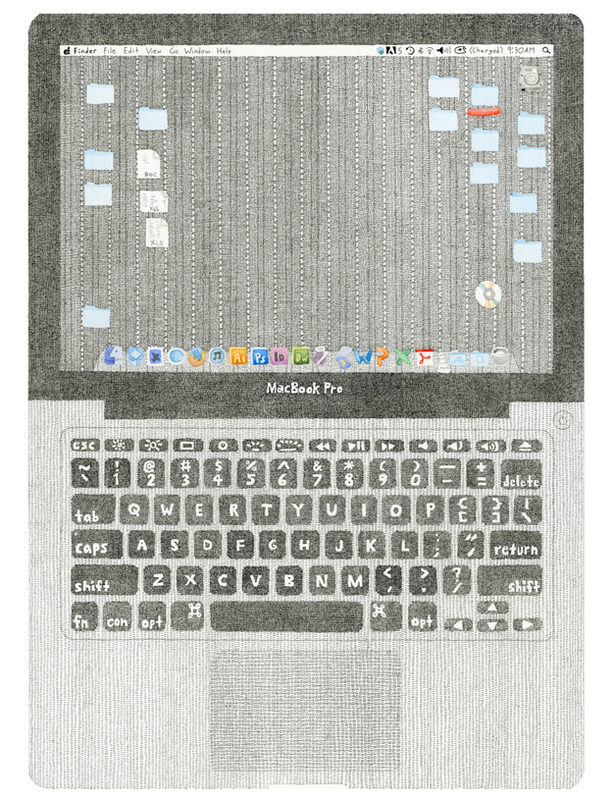 In an age in which the critique of the commodity haunts us, Rosenthal uses such commodities—the laptop, the iPhone, and their easy access to information—to her advantage, rather than as a prop. Her work is not a cheap critique or an accumulation of hash-tags. She is a true documenter who is able to classify and even deconstruct the information she acquires. All that aside, and perhaps what matters most, is that she creates beautiful work. Sabina Tichindeleanu is an artist, independent art reviewer and curator. In 2012 she started ArtGrind, where she posts reviews, poetry translation and updates on current projects.